Picture this: you come home from a day at work and your dog is so excited to see you that he goes bonkers – jumping, barking, racing around. Or how about this: you’re walking your dog around the neighborhood when he spots a squirrel, and explodes full speed ahead, either unaware or unconcerned about the 6 foot tether attached to his neck. What about this one: you leave your dog alone for 15 minutes and when you come back, you see the remnants of your chewed-up remote control scattered all over the living room. Does any of this seem familiar? That’s because this happens to ALL of us (dog trainers included!) at one time or another. Behavior “problems” (which are actually just normal dog behaviors that we have deemed unacceptable) are very common, but can be extremely frustrating to deal with if you don’t know how to begin to fix them. When dealing with these kinds of behavior issues, many people first turn to an aversive training tool, which means you’re subjecting your dog to an unpleasant experience at best, and serious pain at worst. If the dog jumps on you, knee him in the stomach; if the dog pulls on the leash, put a prong collar around her neck; if the puppy pees on the floor, smack him with a newspaper and rub his nose in it. People are sold these methods as quick and easy fixes because that is what old-school dog training taught us to do. This type of training is pervasive – they come up in internet searches, pet stores and even some dog trainers who refuse to accept what the majority of pet professionals have learned through rigorous scientific testing. I used these methods until I became a dog trainer and learned new and better methods. What I remember from this time is that even with harsh corrections, the problem behavior either took a very long time to stop or never stopped at all. Housetraining took months, the dog still jumped up and the dog got a red mark around the neck. So if these are such easy and reliable fixes, why are we still addressing the problems months later? Before we get into the “why” I want to give you a 10-second rundown of vocabulary lessons. Positive Punishment: positive doesn’t mean “good” in this context, it means that a punishment is being added to the situation – a shock is given, tension on the collar is added, etc.-in an attempt to decrease or stop an unwanted behavior. Positive Reinforcement: rewards such as treats or praise is given in an effort to increase the frequency of a desired behavior. What people don’t realize is that if you decide to use aversive methods to train your dog, YOU still need to be trained on how to effectively use them. Not using proper training techniques with these aversive tools can be detrimental and dangerous for your dog! Unfortunately, you can snag many different kinds of aversive tools online or at the pet store without much, if any, direction on how to use them properly. It is true that I advocate for positive reinforcement 99% of the time, however there are some very limited instances where I think positive punishment training can be utilized effectively. Because of the potentially detrimental side effects discussed below, positive punishment training should be a last-resort option. First, were other means of training exhausted? Second, is it a life-threatening behavioral problem? Can you live with or manage the problem? If it’s a situation where your dog has a terrible habit of running into busy streets or is super intrigued by venomous snakes, and other training methods didn’t resolve the problem, positive punishment could help save your dog’s life. However, be sure to sure to consult a professional before embarking on this journey! The intensity of the punishment is one factor you want to consider. If you start off with the punishment being too weak, the correction is not effective and the dog will continue through the pain. In the process of making the correction strong enough to be effective, you risk your dog habituating (or becoming used to) the correction making it even more ineffective. On the other hand, if you start off with a correction too strong, you risk traumatizing and/or injuring your dog. Think about speeding tickets. I bet you still speed sometimes even though you’ve gotten a ticket. The amount you had to pay may not have been a big enough punishment to no longer speed. But if you got pulled over and got a detrimental punishment, like a punch in the face, you may not even want to get behind the wheel and attempt to drive again. Often times, the correction does not treat the underlying issue, only the resulting behavior. A behavior can mean different things in different contexts. Let’s take barking for example. Our dogs bark out of excitement, to be territorial or out of fear. The biggest mistake that can be made is to use aversive training to treat fear. If you use a shock collar to make your dog stop barking at the lawnmower, you’re only giving your dog more reason to be afraid of this scary loud machine. In essence, you’re making the scary thing scarier. Definitely not the connection we want to be making! Using aversive tools in these sorts of cases is like slapping your child when she cries after seeing a scary clown. Most likely, the dog will become more fearful and may even become aggressive in attempt to make the situation safe again. If you don’t use aversive tools the right way, your dog will learn to be sneaky. Your dog may learn he has to heel right by your side only when he has his choke chain on, will only come quickly when wearing the shock collar, or only stay off the counters when you’re home. As my mentor puts it, a correction needs to be a “correction from God” meaning that he never associates the pain with YOU. It’s just some magical, bad thing that happens when he jumps on the counter. This takes patience, forethought and planning. 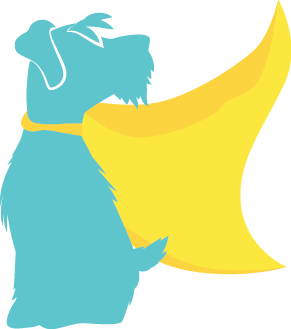 Done correctly, your dog will associate the correction with his behavior and not the source of the correction (you). Sounds easy enough, right? Wrong! In fact, this hardly ever happens, which is why owners carry around a spray bottle of water or need to replace can after can of pet corrector sprays. In order for an aversive tool to be effective, the correction must follow the undesired behavior consistently until the behavior ceases. If your dog jumps on the counter and gets rewarded even once out of 15 times with a piece of pizza, he will still attempt the jump – even if he gets occasionally shocked by the collar! Sometimes acting out the behavior without the presence of the punishment is even more rewarding. “Ha! I got away with it!” Punishment needs to happen 100% after each act until the behavior ceases. If your dog is experiencing correction after correction despite a lengthy amount of training, there is something wrong with your correction. The biggest reason I don’t like to use aversive tools is because you risk your dog associating the pain or punishment with something in the environment, not his behavior. 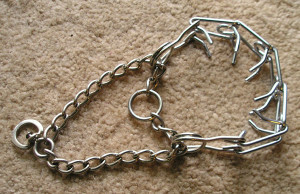 Think about this: you put a prong collar on your dog because he pulls on the walk. Your dog is really friendly and wants to say hi to everyone he sees so he pulls towards them. In an attempt to keep your dog by your side, you jerk the leash thus pinching your dog’s neck. You risk your dog associating that pain with the people and/or dogs because every time they’re near he gets pinched. Pretty soon your dog won’t be happy to see those other dogs and people and instead will become fearful and maybe even reactive towards them. Instead of pulling to say hi, maybe he’ll bark and growl in an attempt to keep them away. Most importantly, using pain and punishment can be detrimental to the relationship you have with your dog. I bet you wouldn’t like a person who randomly and unpredictably slaps you in the face. Your relationship with your dog should be based on trust, not fear. Instead of reaching for the choke chain or prong collar, try other training tools that don’t elicit pain. My favorites include the SENSE-ation Harness and the Easy Walk Harness for smaller kiddos or those that don’t pull too hard. For bigger kiddos who have a lot of strength, I recommend the Gentle Leader. None of these tools will completely stop your dog from pulling but will make it so they can’t pull as hard. You can use these tools as training wheels to help you while you teach your dog how to walk with a loose leash or you can decide to use them forever. Teaching your dog what you want versus what you don’t want is much easier and goes a lot further. If your dog jumps on your guests, teach him to go to his bed instead of shocking him or asking your guests to knee him in the chest. If your dog barks at the fence line, teach him a reliable come. If your dog is doing something you don’t want him to do, teach him what you would rather him do instead. In the dog-training world, a punishment is defined as a consequence that eliminates or lessens the likelihood of a behavior occurring again. If leash popping your dog would stop him from pulling on the leash, you wouldn’t still be popping the leash 4 months later. So if you just can’t eliminate that pesky behavior you dog does, rethink your training. Try teaching him appropriate behaviors and reward him when he’s behaving how you’d like. Not only will your training progress but your relationship will blossom also.